“The Pilgrim St. Set just get better & better.” Apologies to Warren, whom I am quoting, but I’m sure I THOUGHT it first! What I particularly like is that, over time, the ratio of covers (“bed covers” / “Saturday night covers”??) to originals has shifted to the point where only two numbers tonight (I think) were covers: Zappa’s Chunga’s Revenge and Soli by Gong. The rest were all high-octane, high quality originals by band members and I managed to catch some titles this time! Ventouse was penned by Paul Susans and Progress by Richard Burns: Gary Turner gave us Armadillo and (his take on An English Country Garden?) Plantlife. An Edis original opened the second set and was followed by Number One, inspired by Burns’ experiences of “riding the bus.” In the intro he tried whistling into the mic’ then, dissatisfied with the result, inverted his trumpet and whistled across one of the valves before returning to conventional playing. Shame – there must be a place in jazz for Pan Pipe improv? All seemed mellow to begin with (or was it just that I had graduated from Beck’s Blue to London Pride?) but something exciting must have happened mid-journey judging by the electrifying solos. It’s a pity Burns now has a car (he told us so last month) as who knows what the 21X from Bishop Auckland might have inspired! He also told us last month about building a compost store and tonight we learnt that he was moving house (“any volunteers?”). When he asserts that people seeking anecdotes are “clearly in the wrong place” he is seriously under-selling himself! 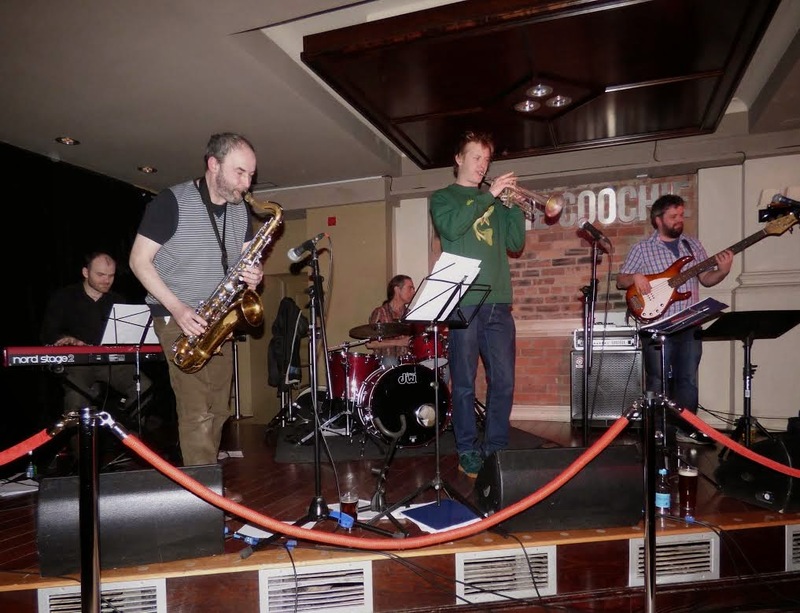 The second set also featured a “world premiere” of an Edis original – Elastic – which Burns declared “difficult – it has 20 notes” but the band managed to stretch to that! And Conkers (Gary Turner) which the tall trumpeter averred was about “smashing your mate in the face when you’re a kid”! It certainly made an impact with the audience who demanded an encore…..and were rewarded with Spug(?) by Paul Susans for which my scribbled notes were: “slow-burner – lotsa noise eventually – Rob goes crazy” , as did we all! Warren says he “knows nowt”: I probably know less but I know what I like. This excellent venue and these musicians are giving me more and more of what I like!